I have some good news to announce: Älymystö will release a compilation album in august and also perform 3 live shows to celebrate the event! For a while things within Älymystö have been more active behind the curtains of silence. Some time ago the old and apparently not-so-trustworthy studio computer of Studio Vainohulluus came crashing down, breaking down the main harddrive and erasing majority of Älymystö raw material. Only pre-mixed bounces of the tracks survived since my backup routine was a bit, err, forgotten. So, we were left with a pile of unreleased demo tracks from various parts of our career: sounds like a legit time to clean up the table and release a compilation CD by Älymystö. We are still shaping the release to it’s final form, but for now the running time is approximately 60 minutes and it’s made of some completely unreleased tracks, some new mixes of old songs, and even some live tracks from old shows. The release date of this baby is set to 15.08.2013. More info TBA. That’s all for now, more information to follow & cheers in the meanwhile! Piratismin vastainen taistelu jatkuu verkossa TTVK:n ja IFPI:n huitoessa tuulimyllyjä ja netistä jotain ymmärtävien katsellessa sivusta vaivautuneena. Viimeisin väsyttävä törppöily koskee Pirate Bay -sivuston blokkausta, josta jo pari mediaa ovat ehtineet uutisoida, että nyt se laiton lataaminen loppui. Valitettavasti vain missään maassa, jossa tämä blokkaus on toteutettu, sillä ei ole todettu olevan kuin korkeintaan hyvin lyhytaikainen vaikutus palvelun käyttämiseen. Älymystön kannalta tämä blokkailu on vähän tylsä veto, sillä levitämme mm. Atomgrad-albumiamme promootiomielessä Pirate Bayn kautta. Lienee siis tarpeen esitellä nykyisille ja tuleville faneillemme kuinka tämän hyödyttömän eston voi kiertää minuutissa. Dear friends. Tonight marks our 10 year anniversary. 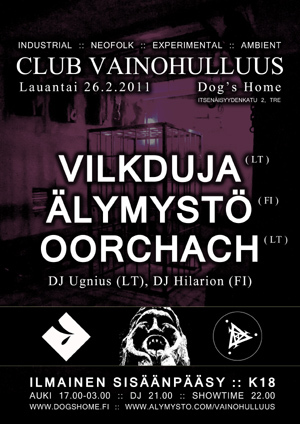 We shall celebrate the occasion at Club Infektio in Helsinki, TONIGHT. 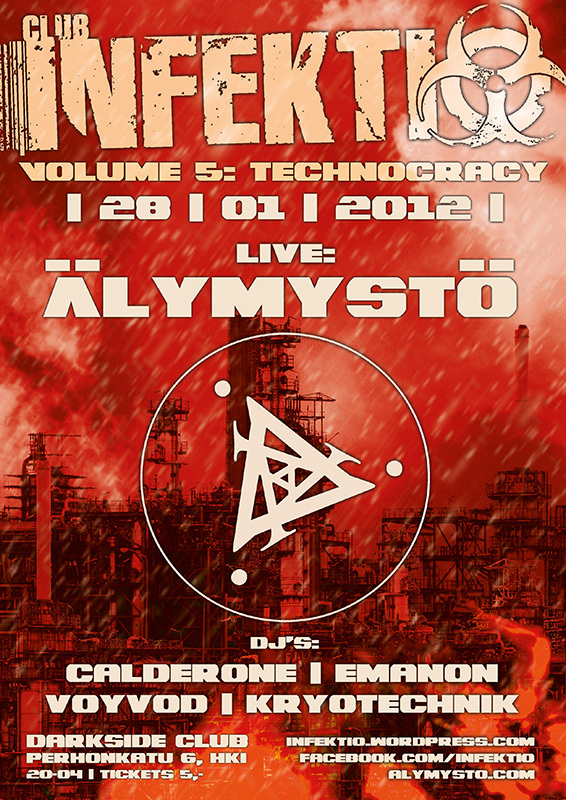 To celebrate the 10 year anniversary of Älymystö, we will perform live in Club Infektio @ Darkside, Helsinki in 28th of January 2012. Most likely it will be the only chance to see us live for a while again, so remember to book the date to your calendar. The stream should be online around 21:30(+2 GTM), and the first show is scheduled to start at 22.00. Last summer I had a great time at the Tuska metal festival playing theremin on the stage with Enochian Crescent. They liked what they came up with for the song Muistoja Sorkasta and earlier this year they asked me to record it for their new album, NEF.VI.LIM. The album is now out, theremin and all, and currently on the first place of Finland’s mid-price top-10 list. If you want to check out some quality black metal for Finland, go get it!